Hi folks, Doc here. My buddy Bob Lian sent in the photos below of his No. 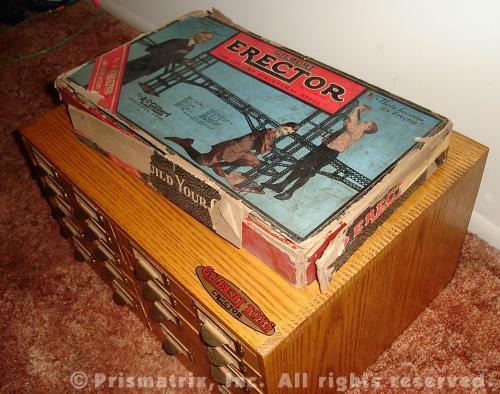 A Giant Girder set. This set was the first of Gilbert's so-called "accessory sets". Each accessory set contained special parts designed just for that set. In this case, the special parts were the newly designed wide beam, or truss, girders. Three sizes of girders were produced: 6" straight (#BI), 12" straight (#BJ), and 6" curved w/flange (#DV). The set, which included 442 parts in all, also contained a bull ring (#AY) and bull wheel plate (#AZ), 22-hole large baseplate (#DQ), and disk wheels (#DM) with rubber tires (#DR), among others. 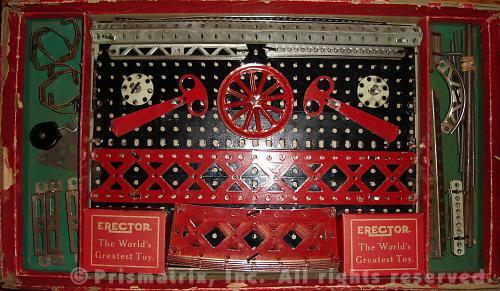 The set, which weighed in at about 10 pounds, is rare today (although the parts themselves are not as difficult to find), because it was packed in a cardboard box which was ill-equipped to support its weight (see photos below). The cover art was the same as that used on smaller sets, but it carried a banner across the lower left corner with the set name printed on it. 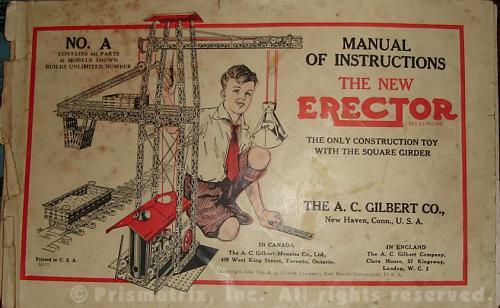 Only a year later, in 1928, Gilbert would redesign the wide beam girders featured in the A set. Called "big channel" girders and designated EX, EY, and EZ, they were no longer completely flat, as their predecessors had been, but instead featured a grooved channel along each long edge, similar to the ones found on the regular A, B, and C girders. In addition, the new curved girder (#EZ) was missing the flange found on that the earlier DV curved girder. Unlike the No. 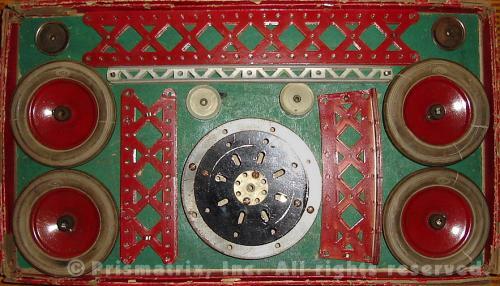 B Ferris Wheel accessory set introduced in 1928, the No. A set was not designed with a feature model in mind. Instead, the No. 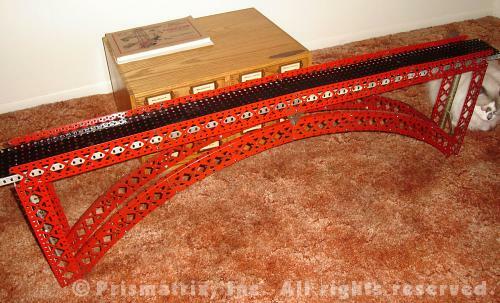 A manual contained 42 fairly nondescript models, one of which is the 3-foot long arch bridge shown below. The No. 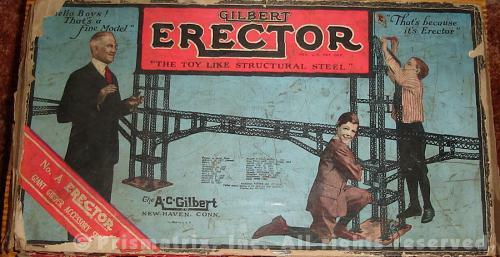 A Giant Girder set was produced for just three years, from 1927 to 1929.